Here’s the thing: This is not, by any stretch of the imagination, the worst episode of this season. There’s a promising opening, and though the promise turns out to be like the sexual boasting of a guy who’s too drunk to get it up, I wouldn’t call the resulting hour of television painful—and some of the recent episodes have left big, ugly welts. I might go so far as to say that a worse episode might have been taken as a sign of health. Supernatural has always been an uneven show, but in the past, it was most likely to go off the rails when it got too ambitious. “Ambitious” is not the word for what the show has been putting out lately. Even with the writers attempting to build a new wing onto the show’s mythology with the Men of Letters story thread, it mostly keeps circling back and retracing its steps, exhuming familiar characters and putting them and the Winchesters through the same old paces they’ve been through a hundred times. 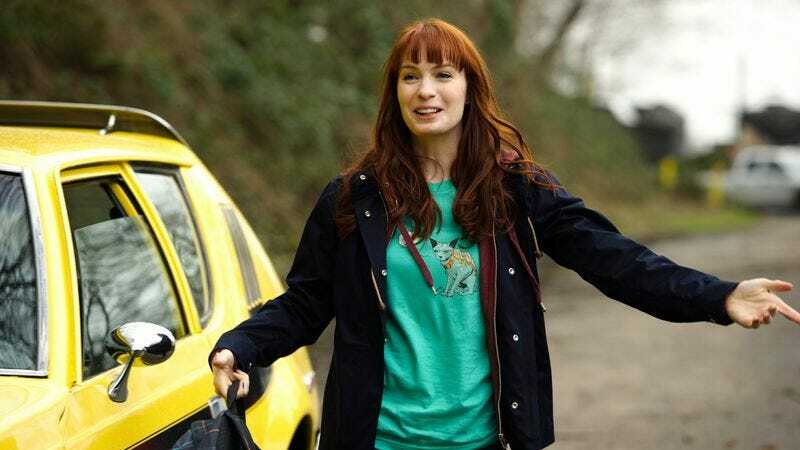 This week, it brings back Felicia Day’s girl-geek character, Charlie. I’ve never been crazy about Charlie, but even if I were, it’s only been three months since we saw her last, in the ill-advised and similarly under-baked live action role-playing episode. Seriously, how can we miss you if you won’t go away? Don’t get me wrong; Day isn’t the big problem here, unless she wrote the script under a pseudonym. Maybe my expectations have shifted down to better match her abilities, or maybe it just took her a few episodes to relax and get into her character, but she’s fairly winning this time, and has some funny moments when she’s tagging along with Dean, playing apprentice hunter. I smiled when, introducing herself as FBI Agent Ripley, she got flustered and flashed her fake badge upside down. (Afterward, though, when she apologized and told Dean, “I couldn’t control-alt-delete my way out”—not so much.) Unfortunately, much of tonight’s episode is devoted to filling in Charlie’s tragic back story. Her mother has been in a hospital bed, hooked up to a respirator in an irreversible vegetative state since Charlie was 12, and she’s been “donating” money toward her care for years. She also sometimes sneaks into the hospital room and read The Hobbit aloud to Mom, because Mom used to read it to her, which explains why she’s a geek. As tragic back stories go, this is tragic, all right, but a tragic back story was not the missing ingredient that was needed to make Charlie more fun to have around. Charlie, who based on her previous experiences with the Winchesters already had damn good reason to be impressed with them, also announces that she’s now really impressed with them, because she’s just discovered the series of divinely inspired meta-fictional genre novels that describe their adventures. (Sam would like to find all the copies of those novels and burn them, because they make it sound as if he has no game. Charlie breaks it to him that readers can find them on the Internet now.) The reference to the novels, and a later scene when a coroner takes Dean by surprise by demanding that he fill out the proper paperwork for a request he’s made, instead of just rolling over for him when he tells her he’s Agent Whoozis, make it look as if the episode itself will turn self-referential and deconstructive. But it’s just a shout-out to past glories, something that the viewer stuck watching this episode instead of a rerun might not appreciate. The impression that the show is trying to get by on flash cards instead of real writing persists into the big set piece, when Dean follows Charlie into a dream she’s experiencing, which is based on a video game. The two of them trade exposition while shooting at “super-soldier vampires” inside a military building in 1951. (Harry Truman’s picture is on a wall. Historical context!) Charlie explains that, after her mother slipped away, she hacked into the company that created the game, altered its content to suit her own “ragingly liberal politics,” and put it on the Internet for free. What was the political slant she saw in the game as it had been designed, and exactly how did she change it? Dunno; that’s never even hinted at—I guess somebody just thought it would be a cool thing for her to say. She’s been placed inside her dream by a djinn who feeds on fear, and who wants her to be terrified during her last moments. Dean describes the process as “an infinite loop,” which is also how the game she’s dreaming about is said to operate. It’s probably unintentional, but that detail is the real deconstructionist critique of the show, because an infinite loop, endlessly and pointlessly repeating itself, is what Supernatural itself now most resembles. This episode peaks about five minutes in, when Dean tosses a bottle of beer to a zonked Sam. The bottle smashes all over the floor. “That’s why we don’t have nice things, Sam,” says Dean. I’ve said it a million times, and I’ll say it again: Jensen Ackles is bulletproof.